Cleaning out your browser's cache* is an important maintenance step that should be taken on a regular bases. In short, you clean it out for privacy, security and to just get rid of zillions of tiny lil files on your hard drive from all the sites you've been visiting! 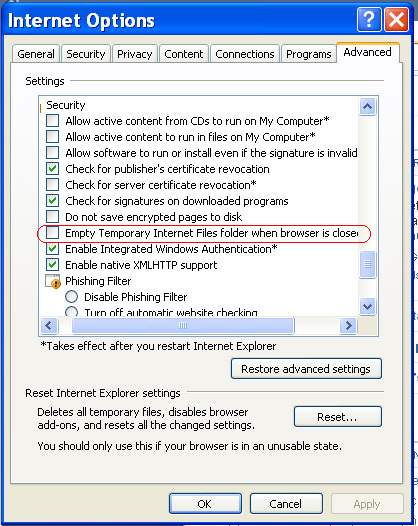 There are two ways of clearing out Internet Explorer's (IE) cache... manually and automatically. As the text says, it will delete cookies and saved passwords. This means any sites you visit where you told IE to remember you... where you don't have to log in each time you visit (e.g PC101) ... you'll have to log in again. Once you click the lil box that says "Remember me" IE will then save the password again. 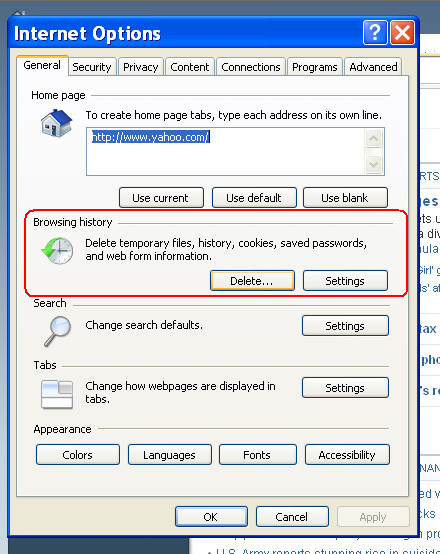 To clear IE's cache automatically (each time you close the browser) you'll still go to Tools -> Internet Options -> click the Advanced tab and scroll down to Security. There you'll find a click box that will Empty Temporary Internet Files folders when Browser is closed. Just click the box and then click Apply.